Morrissey has signed a new record deal to release his first new album in more than five years - just days after taking a swipe at the music industry. He signed once again for Universal, the company who released his 2008 album Years Of Refusal and whom he claimed in his recent memoir had given him a deal "against their will" last time round. Morrissey has signed a two-album deal and will begin recording in France next month with long-time collaborators who include guitarist Boz Boorer. The announcement comes just a matter of days after Morrissey was critical of the record business. He said: "The actuality is that radio stations will not play my music, and the majority of people have lost faith in the music industry, and it's generally assumed - quite rightly - that the number one chart positions are 'bought' by the major labels, so there really is no passion left in pop or rock music, and I don't think people believe for an instant that the faces we constantly see on television and in magazines are remotely popular. "It's all, now, solely a question of marketing. All success stories are safe and dreary, and you will never be taken by surprise by a hit song that sounds out of place. This is not just my view but the view of everyone I know." His new worldwide deal has been signed with the Universal-owned Capitol and the albums will come out through the Harvest label. Former Smiths frontman Morrissey drew acclaim for his book Autobiography when it was published in October of last year although he less than complimentary about how his last release was handled. He wrote: "Universal signed me for Years Of Refusal against their will, and lumpen new management densely release the album during the week of illicit industry cardsharing known as the Brit Awards- a fishy con game where the most powerful labels pay each other off with jiggery-pokery awards for the acts that have already been earmarked for calculated enlargement in the year to come." After a single failed to make the top 20, he grumbled that his management "seem unable to do anything". On the strength of his chart-topping book sales Morrissey has said he is working on a novel. "In 2013 I published my Autobiography and it has been more successful than any record I have ever released, so, yes, I am midway through my novel. I have my hopes," he posted on his fan site True To You. Madonna has apologised for using a racial slur to refer to her white son on Instagram. Legendary singer Aretha Franklin and Motown founder Berry are to be recognised at the 2014 BET Honours. A week before his big night at the Grammy Awards, Pharrell Williams is happy - and speechless - over his Oscar nomination. Sophie Ellis-Bextor has revealed that her jaunts to Eastern Europe inspired her new album Wanderlust. Grammy Award winner Toni Braxton has a song in her heart and some stories on her mind. Nicole Scherzinger has revealed she is recording some new music. 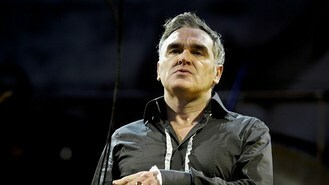 Morrissey is recording a new album after signing a contract with Capitol Music. Josh Duhamel has slammed stories claiming that he is persuading his wife Fergie to distance herself from the Black Eyed Peas.